Background - Pushing beyond the echo-chamber, Childcare follow the slinky art-rock of Put Down Your Pen with the bold and brooding Big Man, an alternative take on dealing with bubble-breaking disagreement and family friction. "There's a place for fighting and affirming the values you stand up for, but too often we ridicule and dismiss those we disagree with. I'm bored of broad-brush Tory bashing and of hearing that everyone who voted for Brexit is stupid. This song is a reminder that we need to listen and try and understand those who believe differently from us." Eliza Shaddad - White Lines. 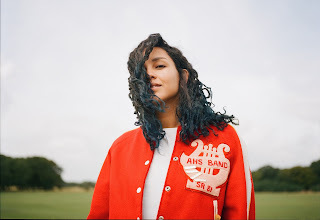 Background - Eliza Shaddad is back with 'White Lines', the first preview from her long-awaited debut album Future. Eliza Shaddad's singular artistry was not formed in any one crucible alone, her work is the flourishing product of modernity without borders. Born to Sudanese and Scottish parents, she’s the descendant of a long line of progressive artists and poets dating back to the 1800s. She also speaks four languages and holds an MPhil in Philosophy and spent a postgraduate year at the Guildhall School studying Jazz Vocal Improvisation. Not beholden to the politics of indie or commercial regionalism, every facet of her music, from vocals to lyricism to performance and production, is the purest distillation of herself. The Vryll Society - Andrei Rublev. 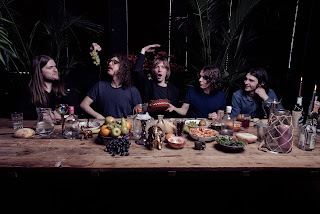 Background - Liverpool psychedelic rockers The Vryll Society announce the arrival of their latest psych-driven single Andrei Rublev, creating further anticipation ahead of the release of their debut album this summer. Inspired by scenes from Andre Tarkovsky’s 1996 arthouse classic film, Andrei Rublev is an emotive charge of hip-hop drums, crunching bass lines and hypnotic guitar solos, hinting further at the themes and ideas likely to form the basis of their upcoming record. 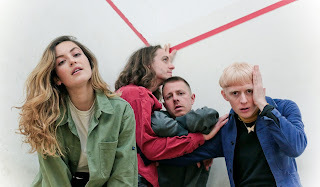 Having produced a series of critically acclaimed singles over the last few years, including live stalwarts ‘A Perfect Rhythm’ and ‘Shadow Of A Wave’, the fast-rising Merseyside outfit are primed for their first full-length release, with impressive appearances at the likes of Glastonbury, Reading & Leeds and TRNSMT helping them develop a staunch grassroots following. Luna Neptune - Elspeth and Elijah. Background - Psych folk producer Luna Neptune releases new single 'Elspeth & Elijah’ and accompanying music video for the 2nd single from the artists upcoming EP ‘Next Automated Wave’. Fully written, recorded and produced by Luna Neptune, mixing and mastering was completed by Alex Fernandes. Jim Gellatly had the exclusive first radio play on his show on Amazing Radio on Sunday 15th April 2018. Melodic and memorable, Elspeth and Elijah features haunting guitar lines, and glitch beats to make an old folk trope - love lost at sea - contemporary and relevant. The Underhill Family Orchestra - Chickasaw Fields. 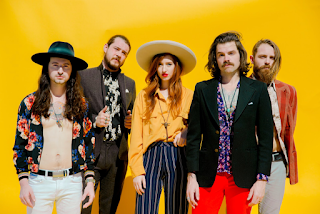 Background - Chickasaw Fields," is the rollicking new single from The Underhill Family Orchestra, that details the strength of working together, compassion, compromise, and relational promise. Inspired by Johnny Cash and June Carter- esque call-and-response style tracks, the song takes the sweetness that Johnny and June shared onstage and rubs a little reality and grit into it. "Chickasaw Fields" is from the band's debut LP, Tell Me That You Love Me, set for release on May 4th via Skate Mountain Records. The single is the second from the record and follows "When The Trumpet Sounds." The Underhill Family Orchestra is currently on tour taking their energetic live performance to stages across the land, and will appear at SouthSounds Music Festival this weekend in their hometown of Mobile, Alabama. WEBSITE. 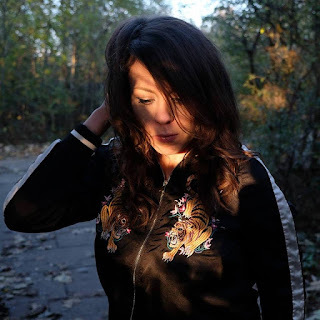 Background - Kat O (ex- Kathematics, Kill TV) formed The Kat O Army in June 2017, releasing the single Victim of Truth (Minorities Unite) independently and launching the song with a successful Victorian tour, followed by NSW shows. Her passionate songs connect to the hearts of everyone who has been let down by friendships, relationships and even the government. The new single I Don’t Wanna Fight was recorded at Toyland in Melbourne and produced and engineered by Adam Calaitzis. Kat played guitar and bass on the track. The song was written in 10 minutes as an ode to 2017, one of the most unbelievably argumentative years ever for Kat. Basically, she didn’t want to fight anymore. 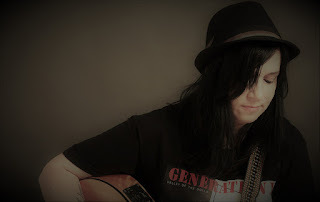 Raw and honest, the catchy pop/punk track is sung in Kat’s unmistakable Aussie accent.